Spain and Portugal both have two of the best climates in the world, and if you were ever undecided on which location would be right for you, keep on reading. We’ve discovered a little slice of heaven where you can have the best of both worlds, perched right on the border of Spain and Portugal on Costa de la Luz. Situated just under an hour from the Algarve town of Faro to the west and the bustling Spanish city of Huelva to the east, Isla Canela is a small Spanish island which is relatively undiscovered. An island formed within the wetlands of the Guadiana estuary, Isla Canela literally rests on the fence between two of the most enticing countries in Europe. With only a 10 minute, €1.50 ferry ride across the river separating the two countries, residents and visitors to Isla Canela really do get the best of both worlds. Also known as “Cinnamon Island”, Isla Canela is home to over 6 kilometres of undisrupted golden sandy beaches where average temperatures rarely dip below 20 degrees. Although this area is still classed as Andalucía, it is part of Costa de la Luz, with just the Guadiana river separating this coastal gem from its Portuguese neighbour less than 10km away. Whether you want to take the ferry ride to Portugal for the afternoon or wander around Punta del Moral marina on the other side of the island, there’s plenty to do on this coastal hideaway. A nature-lover’s paradise, the natural beauty and favourable climate of the island has attracted an array of flamingos, spoonbills and fish eagles which have nestled in the river’s estuary wetlands. A 15-minute drive away is the town of Ayamonte, an authentic Andalusian pueblo which has preserved its medieval quarter, with terracotta-roofed houses and narrow streets, creating a truly traditional experience. 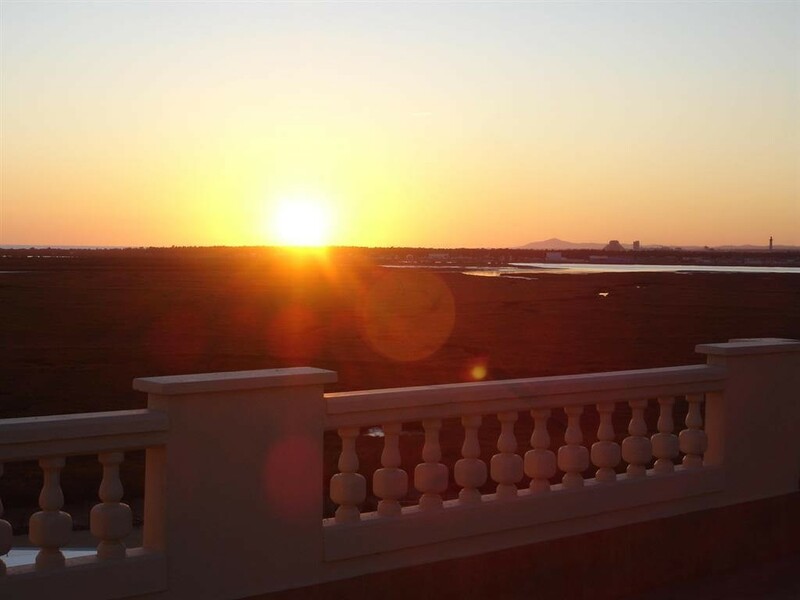 With just a select few exclusive hotels and developments on the island, creating a tranquil atmosphere, Isla Canela is relatively calm throughout the year, even during the busy summer months. So, if you’re still undecided between Spain and Portugal and would love a new life by the sea, Isla Canela might be the one for you! Whilst the area is relatively undiscovered, there’s still plenty to do. Surrounded by nature reserves, sandy beaches and tranquil marinas, the island is perfectly situated just 25 minutes to the A-49, the major autopista which connects the border towns to Seville, the 4th largest city in Spain. Continuing along the A-49 in the opposite direction takes you straight across the open border into Portugal, where 40 minutes down the road is Faro. In a day, you could soak up all the Andalusian culture Seville offers, then absorb the Algarve sun with a bottle of Sagres. It’s as simple as that. Flying there also isn’t an issue, as there are plenty of options; Faro, Seville, Cadiz and the further afield Gibraltar and Malaga. Providing a beautiful and fiery blend of traditional Spanish heritage with a North African flare, Costa de la Luz, or “Costa of Light”, might spark an interest. Just like its Algarve neighbour, summer temperatures reach the mid-thirties, whilst an ever-present cool Atlantic breeze makes the heat bearable. From the Donana National Park and the countryside around Conil de la Frontera, to the major port city of Cadiz, there’s something to entertain all. In comparison to the cosmopolitan Costa del Sol to the east, Costa de la Luz boasts finer, sandier beaches and areas of unspoiled coastal beauty. For the seasoned and savvy visitors, the area is a haven for magnificent hidden coves and crystal-clear waters. With the Atlantic, Mediterranean, Portugal, Costa del Sol, Gibraltar and inland wonders such as Seville right on its doorstep, it’s not difficult to understand why so many choose Costa de la Luz as their new home. Possibly the biggest selling point of this part of the world is the property prices. Despite being so close to major tourist destinations and the long-standing Costa del Sol holiday resorts, the property market in Costa de la Luz rivals that of the renowned Costa Blanca South, without being over-developed. Expect prices in and around the €100,000 mark for a two-bedroom apartment with sea views, significantly cheaper than the Costa del Sol. If all that has piqued your interest, let us show you what the beautiful Isla Canela has to offer. At Sequre International, we pride ourselves on offering our clients the best deals with the very best service. From a designated property consultant based on the coastline of your choice and a personalised viewing trip to see the property at just £99 per person, to an extremely dedicated aftersales team who’ll aid you with everything from furnishing your home to renting it out if you require – we’re with you every step of the way. We understand that buying a property in another country is a huge step, which is why we’ll also help you with currency exchange, legal and mortgage advice, all the way through to recommending the best restaurants to eat at. So, how does a 2 bedroom, frontline beach apartment with a 1 year free family golf membership for €140,000 sound? Or you could take a look at a 2-bedroom apartment, next to Isla Canela Golf Club, with a 1 year free family membership and just a 5-minute drive to the town centre, for €93,000? Available exclusively to Sequre clients, why don’t you book a viewing trip to see this beautiful part of Spain and view these properties in person? All you need to do is give us a call and our friendly property consultants will handle the rest.